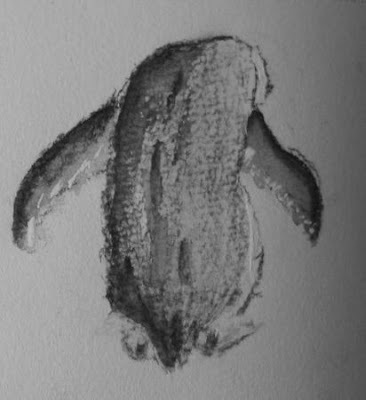 Many thanks again to Yvonne for the tickets and for the permission to sit and paint and doodle. The Two Oceans Aquarium is a wonderful peaceful place to spend a quiet afternoon, provided there are not too many school groups arriving. It is though, tremendously challenging. Everything moves!!!! You have to look and remember!!!! Oh well, I tried! 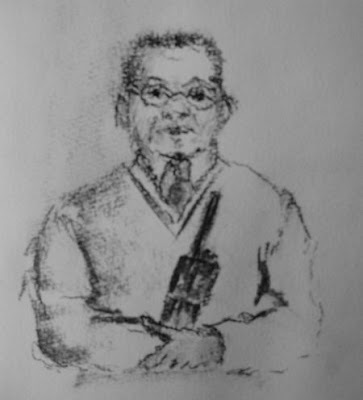 Here is a sketch of the Security guard who really wanted to be drawn! 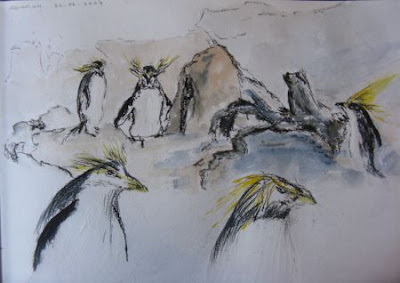 And this drawing using charcoal and watercolour penciles was done at the river walk where you can see the African and rockhopper penguins. I must add that the wonderful Volenteers who take people around and give them all the interesting snippets of information are the most highly under rated people in the organisation. Our thanks go out to them, one and all. 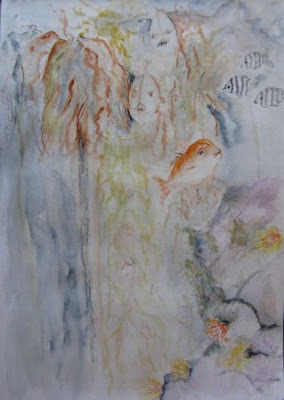 Below is an attempt at a watercolour of the kelp forest. In the end I gave up and just gazed, oh so peaceful, I could have spent all night there. Thanks again Yvonne. Oh lovely Carol. It was a great outing wasn't it. You caught the feel of the place.